For those unable to travel to the outskirts of Xi’an in Shaanxi province in northern China during the fall, not lucky enough at that time of year to wander the grounds of an old temple there where an ancient gingko lives, nor able to witness first-hand its spectacular display of yellow and gold, stunning, breathtaking, transformational, we offer a photo portrait of that tree created by photographer Michael Cherney. The image was produced by laying a greyscale slide atop a color slide, the slides taken from different angles. 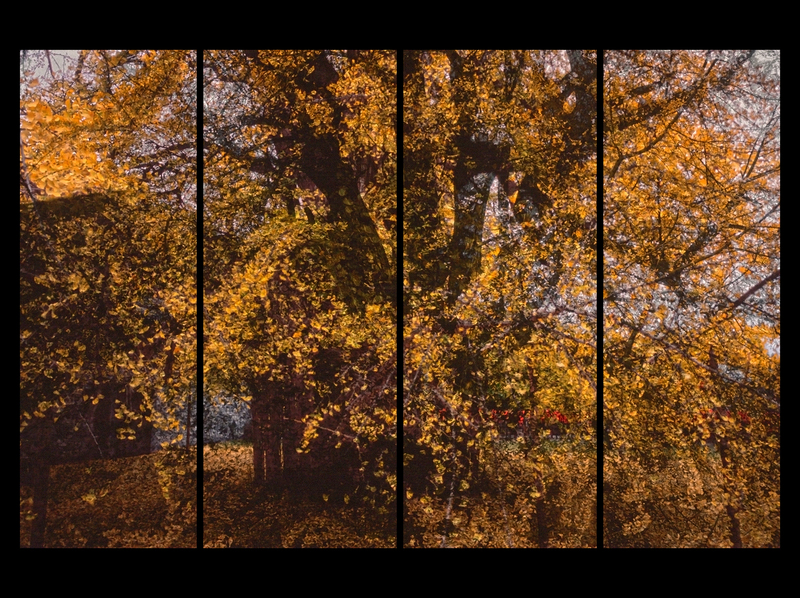 The printed image, mounted as a four-panel folding screen, thus presents the tree from two perspectives, capturing something of its complexity, or, as Cherney has noted, something more akin to the “essence” of the tree. 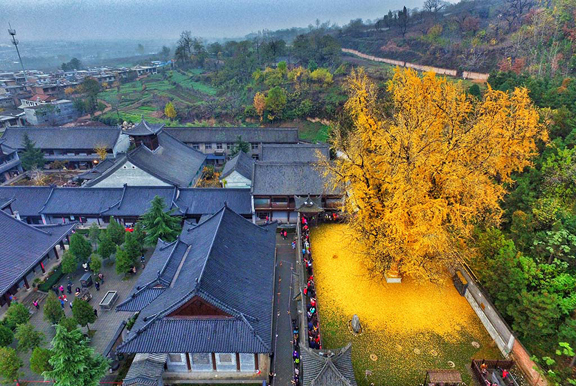 The ginkgo was planted on the grounds of a Buddhist temple known as the Gu Guanyin or Guanyin Chan south of the Tang capital, Xian, during the reign of the second emperor of the Tang and under his auspices. Li Shimin, the Taizong emperor (r.626-649), used his military prowess, political savvy, ambition, diligence, intelligence, and cultural acumen to build and expand the empire, putting it on a path of stability, prosperity, productivity and creativity. The Tang is considered China’s golden age and it is appropriate that this gingko, incomparable in its golden leafage, remains today as a living relic and symbol of that exceptional time. The ginkgo, or Ginkgo biloba, is known in China by several names but historically in its homeland as yinguo or “silver fruit tree.” The first part of the current scientific name assigned to the species by western botanists was based on a corrupted Japanese rendering of the original Chinese and the second refers to the bi-lobed formation of the leaves. The gingko is the sole surviving species of the most ancient phylum of trees, Ginkgophyta, with an approximate 200-million-year history behind it. Extracts from the fan-shaped leaves have long been valued for their pharmaceutical uses, as dietary supplements and prophylactics, as are the edible seeds. The beauty of the tree along with its beneficial value to human health and its great antiquity accounts for the high regard in which it is held in China, where it is the national tree. The Guanyin tree brought to mind another highly venerated ginkgo, which for a thousand years had guarded the stone staircase leading to the main hall of the Tsurogaoku Hachiman shrine in Kamakura, Japan, near our home near Engaku-ji in Kita-Kamakura. Then the unimaginable happened. During a great windstorm in March of 2010, this massive tree was uprooted and tossed on its side, miraculously not damaging any nearby structures. The bereaved populace was comforted by the decision to leave the recumbent trunk in situ, and, according to Kamakura native Prof. Haruko Tsuchiya, after a few years the shoots and branches grew up, gaining strength, and the most promising sprout was selected to plant in the original place of the ginkgo tree while the trunk was removed about eight meters west of the original location. We trust it is flourishing today.